Smalland is a survival game on a much larger scale. You've been mysteriously shrunk to the size of a pebble and thrust into the great wilderness. Before you can begin to try and figure out why, you'll need to find food, water, and shelter - surviving is a whole new game down here. “Fully playable co-op game with a unique that you never experienced before! Our apologies for the late update, due to some miscommunication the update was pushed back. A lot of you have been wondering about an ETA (or estimated time of arrival) for Smalland. You can expect the early access release of the game to launch in about 8-12 months. This estimate is subject to change as the game is only around 40-50% completed; the base of the game is done, but there is still more to be worked on. Funding is being worked on, but no other information can be given at this time. 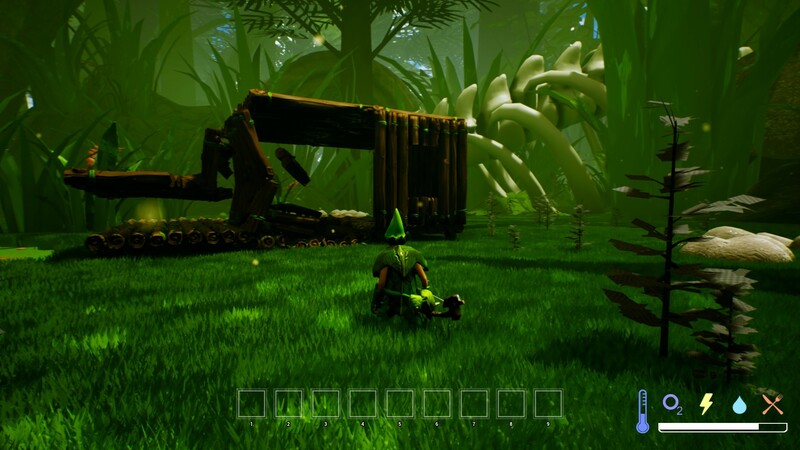 However once funding is completed, more information on the matter will be given along with establishing an update schedule that is going to be either bi-weekly or weekly; future updates may address questions that are commonly asked that aren't already in the new FAQ channel, in game asset exploration, along with new information regarding the game. For all of you backers, you will be delighted to hear that a closed alpha will be made available to you sometime in the summer as well! We are aware of the lack of communication that has been going on in this period and I most sincerely apologize, I neglected its importance. Things got very rough with all the issues I encountered during the endeavour of finding a new publisher and I have been slammed with e-mails and have been employing most of my time in pitching the game. That being said, I promise that there will be a drastic improvement in communication from now on. I'm also working on a road map along with other things that will allow you guys to track the project's progress. Regarding the deletion of some messages, I'm doing it with the best of intentions for the project's good and would like to keep this topic away from being open on Discord or Steam. By that I mean, that publicly spreading the (partial/incomplete) information contained in Sid's video can only harm the project and its image in a moment of weakness such as this. For any concerns regarding the matters at hand, just DM me and I'd be more than happy to clarify them. Given that I'm handling a lot of things right now I can't immediately write down the reply answer to each point mentioned in that video, however, expect this to happen in the upcoming days. This project really means so much to us, and I want to thank all of you out there that have supported and will keep supporting it. Suddenly you have been shrunk. Mysteriously, you have been exposed to a very familiar, but largely different world. What has happened to you? Are there other victims, or are you alone in your tiny plight? There are so many questions that need answering - but don't worry about that right now...that squirrel watching you, is looking pretty hungry. There's an adventure out there waiting for you when you're small - a new world full of challenges to conquer and ecosystems to explore. Though take care, for this world is as dangerous, as it is amazing. You'll need to keep your wits about you and craft tools to keep yourself alive in this new world. With the help of your friends, you don't have to do it alone. If simply experiencing the world from a new perspective is what you want, you can admire a breathtaking sunset or experience the beauty of nature from an all-new perspective in peaceful mode. Being this small opens up brand new places you could never dream of going at your normal height. Protip: don't go into the sewer when it's raining. The world of nature is about the struggle of survival. At this size you are no longer above this struggle. Every animal in this ecosystem is trying to get from day to day, and it does not matter to them if you do anything or not. Ants take food for their colony, cats hunt mice, life goes on. A problem we've seen in a lot of survival games is that there isn't enough symbiotic interaction with the world. It could rain for days, and it doesn't affect much more than your mood. But at this miniscule size, involved interaction with the world around you is all but unavoidable. You can't ignore rain or snow anymore. In SMALLAND, the little things make all the difference.